We went with a 32″x32″ shower pan. We painted all of the framing wood in the bathroom with Red Guard. Thus was suggested by a contractor We met. He swears by it. It paints on pepto bismol pink, but dries a red plastic covering over whatever you paint. So if water ever gets through, it will save the wood at least! We then used galvanized corrugated metal as the walls and used hex head screws with rubber washers to help seal where we had to install. I used a clear silicone to caulk the seams.in the shower and where the wall met the ceiling. RV 550 Plumbed for water. The piping continues down the side of the wall to the kitchen where the sink is on the same side. We made all water sources on the same side for easier building. Also a good shot of the shower pan! Because Crab is 6’2″, we ran the plumbing so the shower head would be on the highest point of the ceiling. It works ok for him. He only has to duck a little since our ceilings are a little higher than a standard bus’. A roof raise would have been good for this instance though to be totally comfortable. We went with PEX pipiing and the crimp rings. We bought the crimping tool and a “go/no-go” gauge at Home Depot. Click the link for a direct link to them on Amazon. This is an unfinished look of the plumbing we created to fill our tank only. We then used a water pump. That overheated and died every 30 days bc of our RO water system. 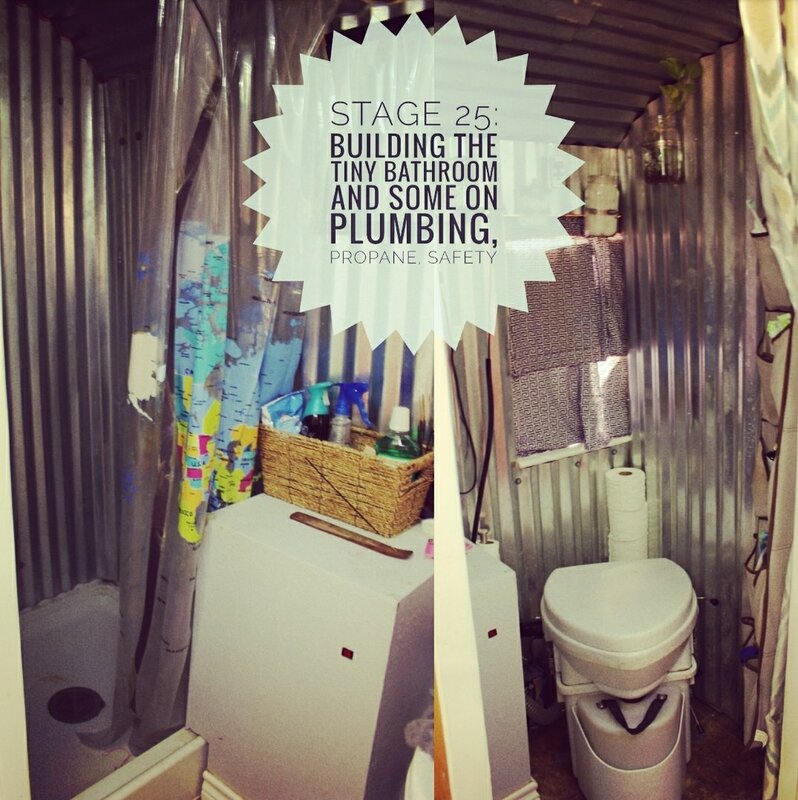 A later post will show the stages of plumbing we did while traveling. We eventually hooked up a city line which saves our pump, and then later we even scratched this set up and went with typical rv connections…more flimsy i think but more comfortable for us. That is coming soon! After much research on youtube and seeing how people liked their composting toilets, we decided to not build a black water tank and just use a compost toilet! The Nature’s Head was what we decided on, as it was really the only one I could find! I wrote an article The Dirty Rotten Truth About Compost Toilets for an in depth look at how I like ours. We positioned it in the corner of the bathroom so we would have space to sit comfortably, and be able to vent it properly, and plug it in to a power source so the small fan inside runs to keep it from being stinky. The Vent Hole for the Nature’s Head Toilet to be able to exhaust outside. Covered in screen, stapled, and polyurethaned down..
We ran copper piping from the propane cage we built underneath the bus up through the floor underneath the water heater. Underneath the bus, right underneath the water heater, we “T”ed a connection to also connect the RV refrigerator to propane since we bought a 2 way by Norcold (info on that in a future article) and it was just a few feet away on the same side of the bus. Romex is in the gray tube, 12 volt wiring to solar batteris in black loom. Copper is in the black foam. It “T”‘s here, one side going into the bathroom for the water heater/fridge side of the bus, the other running up through to the furnace and splitting to the oven for that side of the bus. And since we are talking about propane, lets talk safety. NO BUILD IS MORE IMPORTANT THAN SAFETY. At every connection (2) inside of the bus, I have a Propane Sensor on the ground (PROPANE IS HEAVY AND WILL DROP TO THE GROUND NOT FLOAT) connected 12 V to the SOLAR battieries and they are on 24/7. That is not to say that spraying febreze or other chemical wont’s set off the sensors…that has happened…but I know they work! We also put on and off valves inside underneath the water heater and fireplace so we could turn off the propane easily in here without going outside. The Water Heater with the 12 volt wiring hanging out. The 12 volts powers the pilot light on the heater and another set of wires powers the propane sensor that is installed on the box that covers this. Also notice the red shut off valve on left. Not a Bathroom pic, but notice the shut off valves. This goes through the floor and up to the propane furnace, and right to the stove/oven. Notice the wires hanging out of the loom. Those connect to the other propane sensor we have in the bus. Just not hung up in this picture. Also, we wrapped our copper in foam insulation so that it would not rub against anything underneath the bus. REMEMBER VIBRATION IS YOUR ENEMY. ALWAYS THINK OF HOW THINGS WILL VIBRATE or TWIST while bumping down the road! And things move! We also attached the foam covered pipe with metal hangers securely to the frame of the bus with TEK metal screws. The Black Foam is the copper pipe running under the bus and secured to the chassis. The foam keeps anything from hitting the soft copper and prevents rubbing via vibrations during travel. The black loom is the wiring from our rear camera, LED bar, and wench running to the solar/bus batteries. Crab built a box to cover the plumbing, propane, and water heater and I put a basket on top of it for an air freshener, lotion, and TP holding area. We also trimmed around the bottom of the box and the doorways! We should have gotten a type of cover for the top, stone or wood, but we always keep our eyes open for something to add later. I originally hung the lights on the ceiling but they fell. Now they are on the actual shower curtain. They are waterproof LED lights. The shower curtain doubles as a homeschool tool too! I use a friend’s old shoe organizer to organize our bathroom necessities. With 3 girls and guy that shaves his head, there are quite a few pockets filled with feminine hygiene, extra soap, razor blades from dollar shave club, sunscreen, face and hair masks, all of our toothpaste and brushes…etc. It works Great! In this picture, the organizer is folded back in half. I have played around with all 4 pockets out, and just 3…we adjust to our storage needs at the time. We have a curtain for privacy when showering that we tuck behind the organizer when no one is in their. I also orginally had a towel hanger there but it was in the way a lot so it was removed and we have since found another place for towels. When it came to installing the drain lines, again, this was something never done before. We read the lines should hang at a 1/4″ slant all the way to the end. This lets gravity do its job. So we used some of these awesome metal straps with holes in them (we used these for lots of stuff and hanging things) to hang the 1″ PVC from the sink drain under the bus to the shower, all the way to the rear of the bus to the Gray water tank we installed at a later time while on the road (that will be in the future drain line article). The Rv550 has worked decently the last almost 2 years. Here are the issues we had. The first time we installed it, the face that goes on the outside of the bus didnt really fit. This did not fit in the hole And the unit’s copper pipe did not fit behind the opening to the left either. The company has great customer support. They sent us a new one, no issues. After about 8 months and tracking from Texas to Washington then down to Cali, the water heater sprung a leak shooting water down the outside side of the bus. At least it wasn’t inside. The company sent us another new one, took back the old one, all paid for. It just sucked to have to deal with. Over a year later we traveled from Cali to Arizona and have been exploring the state, no issues. It is hard to find the correct setting for how hot you need it, and lately the hose being in the sun is enough to get the perfect temp shower lol. If it craps again, though, and isn’t covered with the warranty I want to take out the box Crab made to cover it, and install an Eco Temp or other style I have seen other skoolie/tinyhousers use. And we will get some floor space back in the bathroom which would be a cool change:). Previous post: Video: Places to Park Your Skoolie/TinyHouse, Features, & Costs..plus a rv resort review!